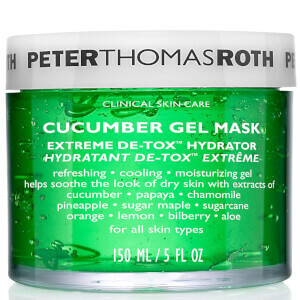 Give your skin a nourishing treatment with the Hungarian Thermal Water Heat Mask from Peter Thomas Roth; a mineral-packed skin treatment that helps reduce the look of fine lines, wrinkles, dullness and uneven skin tone. Powered by the most mineral-rich ‘fountain of youth’ thermal water on earth sourced from deep below Hungary’s Carpathian Valley, the rich and luxurious hydrating mask transforms with cool water into an invigorating flash of heat to open pores and optimize nutrient absorption. Combining bioengineered botanicals Gatuline® RC and Merospheres-V, with a cocktail of natural oils, butters and extracts, the heat mask effectively draws out impurities and feeds skin natural nutrients. The result is smoother, healthier and younger-looking skin that glows with radiance.